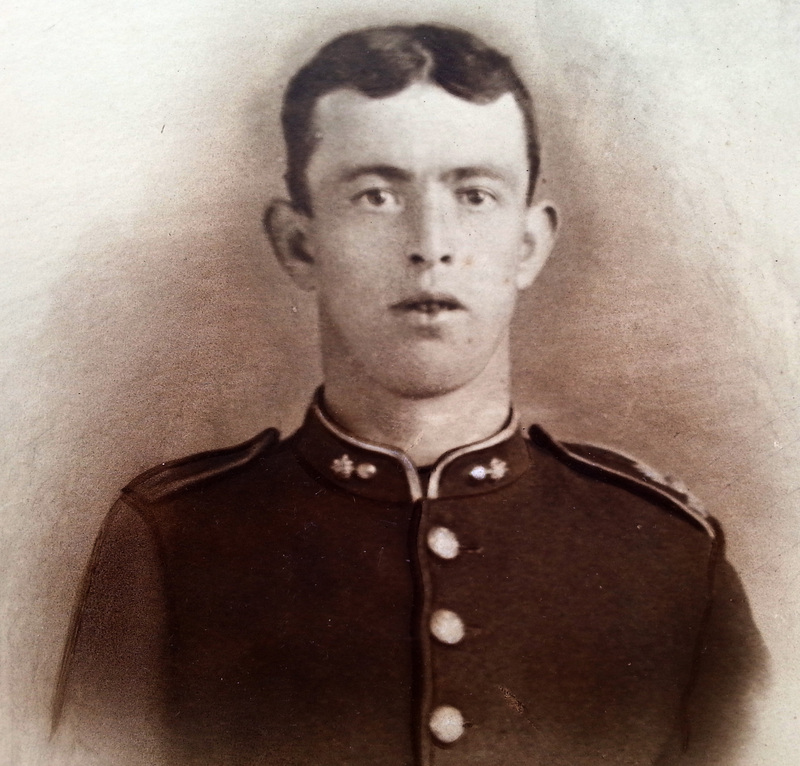 John Frederick Proffitt was born about 1891in Ffrith. He was recorded in the census of 1901 living with his family at Main Road Cottage, Llanfynydd. Head of the household was John Proffitt aged 36, a coal hewer. This census says he was born in Derby. His wife Frances Elizabeth was 33. She had been born in Ffrith. Their listed children were Thomas P 12, Elizabeth E 14, John F 10, Ethel 7, Margarita 5 and Ada 2. The next census was in 1911 The address given was Plas Mia For, Ffrith. John Proffitt, head of the household was then 50 and a Quarryman. On this census his birthplace was given as Oxfordshire. His wife of 24 years, Frances Elizabeth was 43. She had given birth to 8 children all of whom survived. Those listed in the household on census night were Ada 23 a domestic servant, John Frederick 20 a labourer, Thomas Eli 12, George Henry 10 and William Ellis 7. (There is a bg discrepancy between these two censuses regarding Ada’s age. Not sure which is correct). UK soldiers who Died in The Great War 1914-19, accessible on www.ancestry.co.uk confirms all the regimental details at the top of this page and adds that John Proffitt enlisted in Wrexham. This source tells us he was ‘killed in action’. His medal index card also on Ancestry, lists his medals and adds that his first Theatre of War was France and he entered it on the 11th January 1915. On the card are the words ‘K in A 16.5.15 (Death assumed)’. The Register of Soldier’s Effects (Ancestry), in which the army calculated monies owed to deceased soldiers lists John Proffitt and says that his death was ‘officially accepted as on 16.5.15 Festubert. In action’. John’s father – John Proffitt Senior, received from the army £8..18sh..6d in money owed. John Proffitt’s Army Service Records have survived and are on Ancestry. They include his Attestation papers. This tells us that he signed up on the 17th September 1914. His birthplace was the Parish of Hope and he was a 23 year old Labourer. The description of him says he was 5 feet, 5 and a half inches tall, weighed 128 lbs, had a 37 inch chest with an expansion range of 2 inches. His eyes were dark brown and his hair was black. His religion was C of E. The medical officer considered him fit for service. His next of kin was listed as his father, John Proffitt of Rhiw Cottage, Ffrith. The Attestation Paper also tells us that John had served for 4 years in the Territorials. This is clearly why he was called up at such an early stage in the war. He was mobilised on the day he Attested – the 17th September and posted on the 11th January 1915 which confirms what was written on the Medal index card. The records include correspondence regarding John’s personal possessions and a commemorative plaque and scroll and receipts signed by John Proffitt’s father for his medals. The rest of his records consist of a paper trail of correspondence which reveals that the army went to some considerable lengths to establish what had happened to John Proffitt. Some of it is difficult to decipher and some of it is undated. I reproduce them here in what seems to me to be a logical sequence. The first one was written by an Officer at The Royal Welsh Fusiliers Records at Shrewsbury. It is to John Proffitt Snr, the father of the soldier of the same name. The next letter was written from Infantry Records No 4 District at Shrewsbury to the Commanding Officer of the RWF at Wrexham. With reference to the attached enquiry form. I shall be glad if you will kindly question No 6261 Pte Thomas Roberts Royal Welsh Fusiliers as to whether he has any definite news concerning RWF’s 6111 Private John Proffitt who is reported missing 16.5.15 and to report result of same to this office as early as possible. No 6381 Pte TR Roberts is the name of the man who joined this unit on the 8.2.16 and not 6261 Pte T Roberts please. The latter man cannot be traced in this unit. He proceeded to the 1st Battalion. The next communication is from the Commanding Officer at the RWF in Wrexham – presumably to Army Records at Shrewsbury. The attached, received this day from the Matron Military Red Cross Hospital Croesnewydd Wrexham relating to the reported death of 6111 Pte Proffitt RWF, is forwarded to the communication on the same subject. Went to you from this office on the 17th Instant. 6261 Pte T Roberts states that on the 15th May 1915 whilst crossing a dyke, 6111 Pte J Proffitt was wounded and fell into the water. He cannot give any further news of him or tell of any man who might be able to. With reference to the attached correspondence, I beg to forward a statement received from the Matron Croesnewydd Hospital Wrexham as to what 6261 Pte T Roberts knows as to No 6111 Proffitt RWF. No 6776 Pte Bennett states that on May 16th 1915 at Festubert, he buried Pte Proffitt B Coy 1st RWF whose body was found in a disused trench together with that of L Cpl Williams and Pte SW. There is an index card for John Proffitt in The Flinshire Roll of Honour at The County Record Office in H.awarden. It confirms all the regimental details at the top of this page and adds that he served 12 months before being killed in action. The card was signed by his father on the 7th November 1919.